One last "Welcome Back' to school card... My daughter was very sad last week that her favorite playschool teacher isn't her teacher this year... but by happy chance she will be in our classroom this week as our director is off to her sons wedding. So I got sent back into my craft room to create a card for the favorite teacher... 4 yr olds can be so bossy! And I think thats all for today! LOL See you all next week I'm afraid... we have a very busy weekend coming up and I'm not sure how much time I will get down here... But you know I'll be here if I can!! LOL - I remember how bossy 4 years olds are too!! What a lovely card and I'm glad you were told to make it! 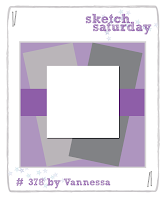 Thanks for joining us at Sketch Saturday. Such pretty papers! I am sure she and your daughter loved it! lol oh I love little Miss S, I can totally hear her telling you to make the card. I'm sure both the teacher and Skyla loved it.